(Seychelles News Agency) - The people of the Seychelles islands situated in the western Indian Ocean celebrate their Creole identity every year between 25 to 31 October during the Festival Kreol [Creole Festival]. For the past thirty years, this is the time when the inhabitants of the islands embrace their tradition and culture through several cultural and artistic events . For the island nation with a population of 93,000 celebrating its identity means giving importance to how this Creole identity was born, particulary as the majority of the ancestors of the mixed race population which exists today, were brought to the islands as African slaves. With such an interesting history to tell, local artist and photographer Urny Mathiot came up with the idea to showcase some of the things the people went through during the period of slavery in Seychelles. Urny who studied art in his college years, has developed an interest in history. He says that the interest matured while he was out of the country for a while and saw how other countries had their culture at heart. 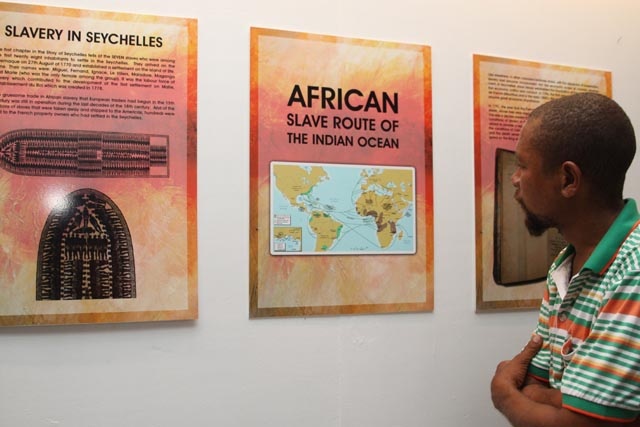 During the recent Festival Kreol with the help of Seychellois historian Tony Mathiot, he set up an exhibition about slavery, at the National Cultural Centre in the capital of Victoria. He wanted to contribute in promoting history that would differ from others and going more in depth on historical topics such as slavery. “What makes my exhibition different from the previous ones is that it does not focus on just one aspect. I worked with the local historian Tony Mathiot and merged research, artifacts and paintings. Documents that were not usually seen have been put on display. 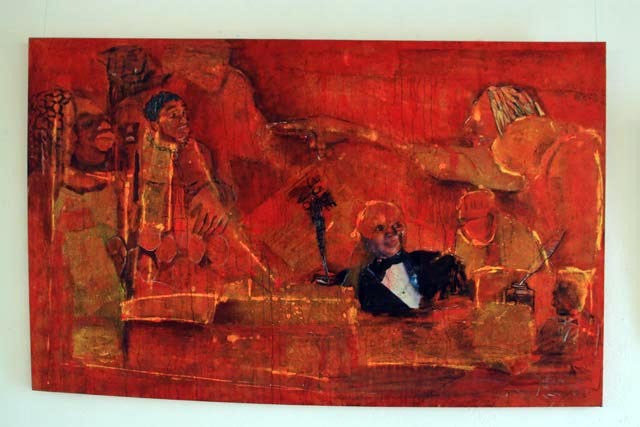 It allows one to view the facts and understand the perceptions of artists of today about the subject. 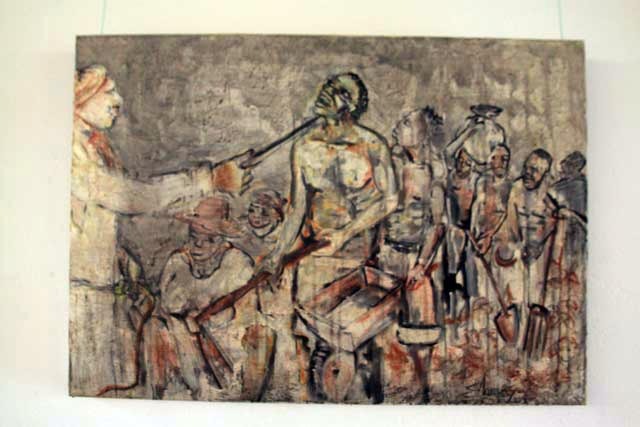 Previous exhibitions about slavery would depict the hardship of those people but I focused on the revolutions that led to their liberation,” Urny told SNA. The groups of artists with works on display in the exhibition are prominent local artists with great interest in the subject. Urny believes that he has received positive responses in his quest to promote history. With more activities involving this theme he could attain his goal of getting the Seychellois people to better value their heritage and historical background. The exhibition also features a register for the slave trade done in Seychelles. 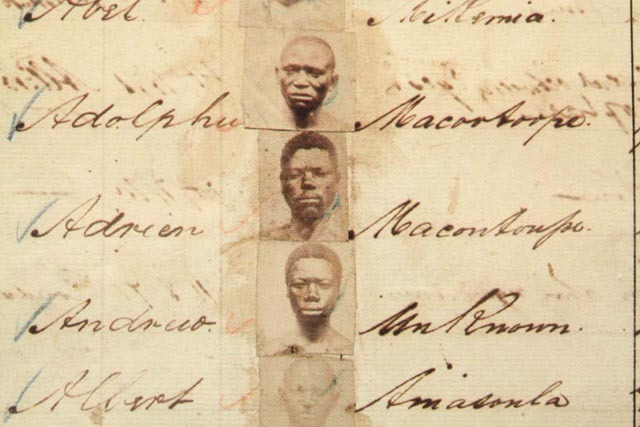 The documents include names of vessels and owners and the number of slaves. They allow today’s Seychellois to make the link between their generation and the slaves that bears the same surnames as they do today, for example surnames like Hodoul, Marie, Bristol and Labrosse among other French names. 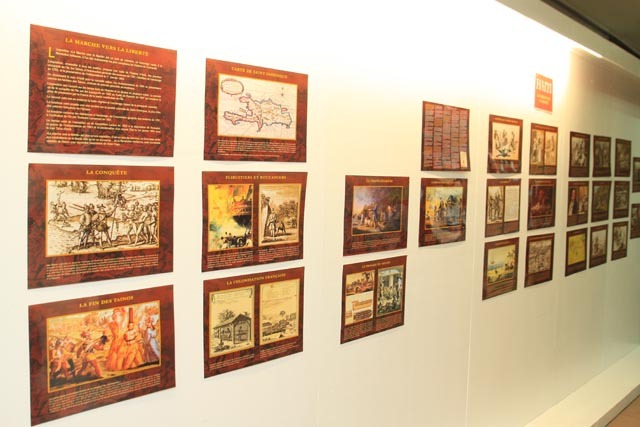 Following Urny Mathiot’s exhibition, the Seychelles Minister of Toruism and Culture, Alain St Ange announced that as of 2016 there will be a date assigned to honour African slaves who settled in Seychelles. 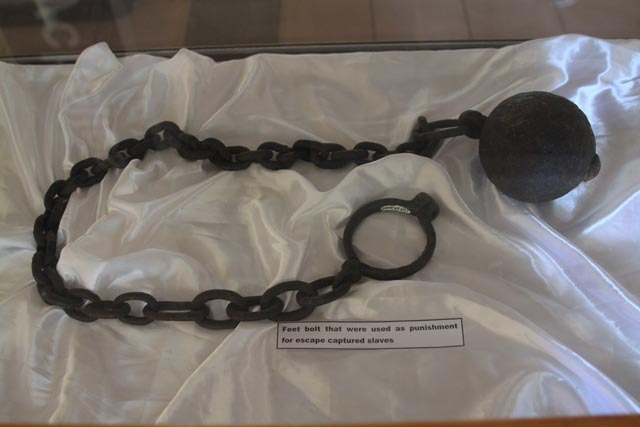 In Seychelles, the slave history started in 1770 with the first settlement by the French. The group comprising of colonists with slaves from Africa and Asia landed on Ste. Anne island. Seychelles was not just a new colony but also a better location for the slave trade. Slaves were brought in from Zanzibar, an island in the Indian Ocean near Tanzania, transited to Seychelles before being shipped off to numerous South American countries such as Brazil and also to the West Indies. The expansion of the slave trade was largely due to the fast development of sugar cane plantations, cotton and tobacco in the Caribbean and America. 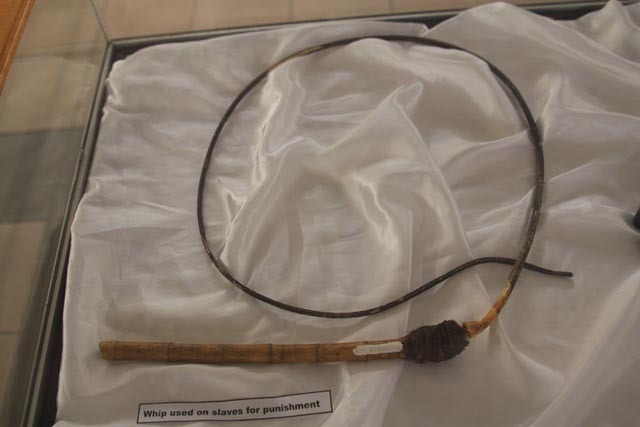 In an interview with SNA, Seychellois historian Tony Mathiot, said that the slave trade expansion was supported by African tribe leaders who helped capture people for the slave traders. This was done to get rid of rebellious or unwanted tribe members who were then traded for weapons or clothes. “We will never know the origins of the slaves who came to Seychelles. The French who captured them didn’t know their language so they were given the French names. It is even hard to know of their tribes even though some came to Seychelles with their tribal marks on their body,” explains Mathiot. With the unsuccessful settlement on Ste Anne island in 1770, due to a lack of support from the administrator who was based in Mauritius, the French settlers who stayed behind with their slaves moved to Mahe, Seychelles main populated island today, and helped with the establishment of the spice garden at Anse Royale in 1772 led by Pierre Poivre who was the new French governor of Mauritius. In 1814 the Seychelles island became a British colony after the capitulation of the French Jean-Baptiste Queau de Quincy who took command of the island in 1794. The British had already established a blockade on the French colonies in the Indian Ocean, which resulted in the surrender of Mauritius in December 1810. The slavery system continued to be upheld. Although slavery was being abolished in several parts of the world from 1688, the situation remained unchanged in Seychelles. According to the History World site, in 1807, the British parliament passed a law that abolished the slave trade but this was not completely enforced in the colonies, and even until 1811, slaves were ruled by the ‘black code’; a set of regulations that determined their religion, child rights, the do’s and dont's and as well as ways they could be protected. In 1834, the abolition of slavery in British colonies came into force, allowing slaves in Seychelles and the rest of the world to gain their freedom. “At the time, the Seychelles population was of 7,500 inhabitants, 6,521 of which were slaves. The administration put in place an apprentice scheme for the liberated slaves. The scheme allowed the slaves to stay on their former owner’s property, work there and they were given non monetary support until they could be independent. Many slave owners and their slaves moved to Reunion Island the French colony where slavery was still enforced,” explains Tony. Slavery in the French colonies was abolished in 1848. Mathiot added that records show that the first person to be born in Seychelles was a man named Jean-Pierre Le Beuze in 1780 although he believes that there may be others born before that date. The Creole nation started to form in 1810, when the first ‘metisse’ child was born. “They would often be the off spring of white leaders and their slaves. The child once born would automatically be in the white man’s custody, he/she would receive the father’s name and would be part of the inheritance. Pierre Hangard is one French known to have property at Pointe Conan in the north of Mahe, who had a black partner,” said Tony. Almost two hundred years after the British abolition of slavery, it would be difficult to trace the races found in Seychelles. The Seychellois people are now a mix of culture and colours with the influence of Europeans mainly French and British, together with African and Malagasy slaves, and Indian and Chinese traders. Today the Seychelles islands and other the Creole speaking countries celebrate their existence and culture. They also celebrate many things they acquired from the days of colonialism and slavery. “The Seychelles gastronomy is another aspect of its culture that could have been inherited from the slaves. ‘Ladob Friyapen’ [breadfruit cooked with coconut milk] was certainly not a meal for the French settlers. The Creole vocabulary is another aspect that could have been influenced by the slaves from the Mozambique coast; for example the word ‘Kapatya’ [basket made from coconut leaves],” says Mathiot. 'Moutya', one of Seychelles traditional dances which has a slow rhythmic movement of the pelvis and posterior to the beat of a large drum, came from mainland Africa. Dancing the 'moutya' was the very few forms of entertainment for the slaves at night. This was practiced more on the other islands of the archipelago and not Mahe, as the British had imposed restrictions under the law on the main island. This year the islands’ tourism and culture minister Alain St.Ange proposed that 2015 would be the year to revoke the archaic law that banned the tapping of drums in Victoria, the old law that was enacted by the British Government when Seychelles was still a colony. This law stopped the 'moutya' drums from echoing in the capital of the Seychelles as it was feared that the Seychellois were passing coded messages using these drums. Artist Urny Mathiot wishes to compile all of the information including paintings featured in the exhibition about slavery in Seychelles in a book in the near future.